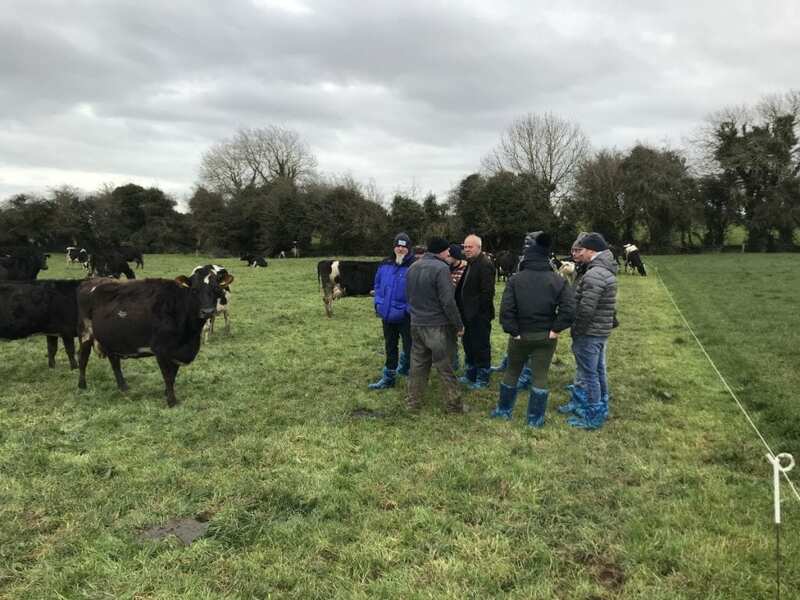 Earlier this year myself and Mark Causey organised a farmers trip to Ireland, with the primary focus of looking at how the Irish utilise grass in all forms. The trip included both beef and Dairy units all of which were utilising grass to its full potential either as grazed grass or foraged crop. 11 of us set out on what can only be described as the snowiest morning I have ever seen. At this point, I personally wasn’t sure if we would even make it to Bristol let alone Ireland but after a little bit of a rush we got to Dublin and loaded ourselves into two minivans and set out to our first visit. Arrived in Dublin, picked up our vans and got on the road, our first visit was to see a Farmer by the name of Partick Hennessy, a Spring block calving dairy unit running 550-600, crossbred, cows on an arable conversion farm in Co Kildare. Partick was a first generation dairy farmer having made the change from an arable trader into a farming partnership with his uncle and cousin. His focus was very much all about profit from grazed grass. The unit boasted a 60 point rotary parlour on which he was feeding dairy cake and had the option to feed a protein balancer alongside when needed. Patrick’s cows were winter kept in outdoor cubicles with heifers in a section that was roofed. He was operating a paddock grazing system, driving cows hard to hit residual covers in order to maximise grazing. The second visit was to Robin Talbot, the only suckler beef farmer we would see on our trip, and I got the feeling he was an endangered species as so much of the beef calves are now coming from the explosion of dairy units. Robin was a top-notch operator, a seasoned farmer with a very pragmatic approach to suckler cows and beef. Predominantly Limousin but running several Belgium blue bulls. All his cows were bought in as heifers and quickly sorted to weed out what he wasn’t happy with to fatten and then keep the best for replacements. Grazing again was the backbone of the summer feeding, but quality silage and a blend was feed to all growing and finishing stock. After getting up bright and early we headed to the Teagues Moorpark research facility near Fermoy, Co Cork. Here we had a tour around the facility looking at some of the wide range of studies they are currently engaged in. We had a chat with one of their staff who was working on the @PaturebaseIE project, which is a joint venture between them and Agrinet to give their farmer members a platform on which to record all their grass growth and management data, as well as monitoring profit, all channelling into overall farm management. I personally could have spent all week here so fully intend on returning in the next year (Watch this space for another trip?????). The next visit of the day was to see a young man by the name of PJ OKeefe, who was named the Irish young dairy farmer of the year 2017. PJ took on the farm from his parents and had grown it dramatically from a 70 cow dairy to in excess of 300 cows. He has invested in a new rotary and, unlike many others, has put up a shed to winter house his cows. Although PJ was still spring block calving and utilising his grass to a very high level he was not stuck in a rut of low cost is the only way. PJ has experimented with Zero grazing when we visited his cows were still inside and he was feeding them a mixed forage diet including veg waste, grass silage and blend. I was also very impressed by his attitude towards staff and staff management, looking to encourage staff development and understood the need to integrate staff into the business. Our third day started with a visit to a gentleman by the name of John Plelan, a beef and arable farmer who is farming over 1000Ha of arable and finishing continental heifers for Dawn Meets near Waterford on the south-east coast. John was finishing cattle on a contract with Dawn meets. His cattle were the first we had seen that were housed on slatted floors, fed a grass silage and concentrate TMR diet. He had chosen to finish all continental heifers sourced from suckler herds in the west of Ireland. His system involved buying in cattle as stores, grazing them in a paddock system to get frame growth and then finishing them on a high cereal and forage diet. Animal welfare was key with intakes and costs closely monitored. From there we had a short drive to take a tour around the Keenan factory in Co Carlow. As many will know Keenan was recently bought by Alltech and has been revived back to a thriving business. The factory tour was very interesting with a general company history to start followed by a tour of the production line and a walk around the company site. I was impressed to see that nearly all of the fabrication on these world-class machines is done by hand. With the site able to produce in excess of 7 brand new waggons per day, none of which can be the same due to all the optional extras and tweaks they can do to suit the customer. After a ploughman’s style lunch we headed off to see another beef finishing unit owned by Leonard Ashmore just outside Kildare. This was again a mixed arable and beef enterprise finishing continental cattle for the Irish beef export trade. Leonard was finishing all steers and unlike the last unit was taking them to 750-800+kg live weight. Still using a grass-based TMR with maize and blend. From here we took a speedy trip to Dublin for what some thought was the highlight of the tour (not really!) the tour around the famous Guinness factory. Needless to say, a fair bit of the black stuff was consumed! After a night in Dublin, we set off on our final day. The first stop was to another beef finishing lot owned and run by Meet processor Kepak Group. This unit was on a different scale to the last two. There where finishing 3500 cattle per year looking to expand to 4000 per year. The farm manager gave us the tour around the facility, which was impressive in scale and efficiency. The cattle are sources again from suckler herds in the west of Ireland. Due to the dramatic increase in the number of dairy farms and the pressure on the number of suckler herds Kepak have started to source some cattle from dairy units in order to maintain throughput. The cattle are kept on slats and fed a TMR diet of Grass silage, maize and a blend of cereals, beans and distillers for protein. Growth rates were impressive at 1.8-2kg daily live weight gain as well as the consistency of animal and yield from the carcass. I have to say that I was really blown away by this unit, although it was not to everyone’s taste, for me it was an example of true efficient beef production on a large scale. All cattle we saw looked well, healthy and not in any-way stressed. Our final visit was to see farmer Joe Leonard in Julianstown about half an hour from Dublin. Joe is farming a spring calving herd of crossbred cows totalling 500+ in number. Joe is a seasoned grazer with a wealth of experience and knowledge in getting milk from grass. His system is cost-effective and flexible. 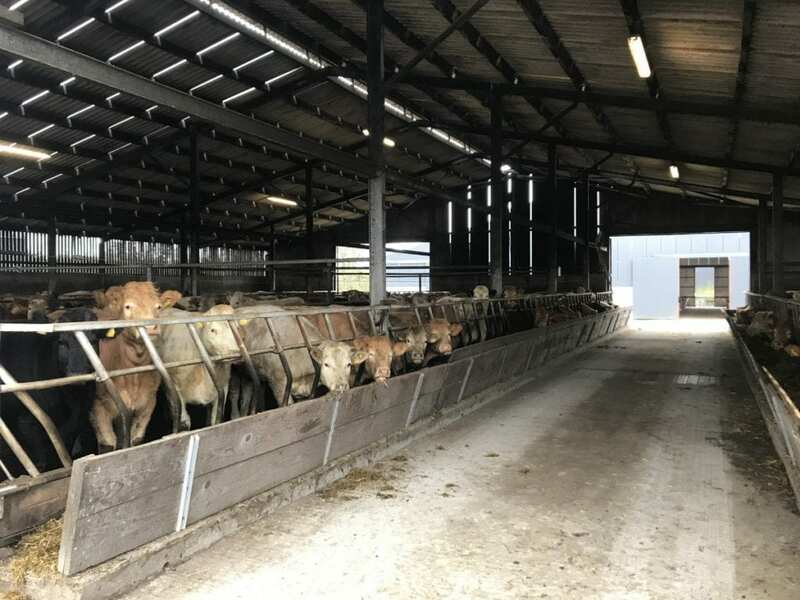 Cattle are housed in outdoor cubicles in order to ensure that cows don’t get ‘soft’ to the weather and are able to get straight to grazing as soon as calved and ground conditions allow. Heifers are reared into these cubicles so they are used to the system when they calve down for the first time. Grazing is the focus of the system set up for max grass growth and utilisation. As with many of the dairy’s we visited Joe has just invested in a new rotary parlour in order to get cows through as quickly as possible. When we visited the turbulent spring was leading to a challenging start to grazing season but all cows were out when we rolled up on farm. In away out last day was a day of true efficient farming. With the Kepak unit finishing volumes of cattle and therefore meat yield efficiently and then to see Joe who was getting serious volumes of milk solids from grazed grass in the most efficient way possible. This was a brilliant way to round of a busy and extremely informative trip. I would like to extend a huge Thankyou to all the farmers we visited, to Teageas and the staff at Moorpark, the Kepak Group, Dawn Meat and Louise Clarke from Alltech, without their help the trip would not have been possible.